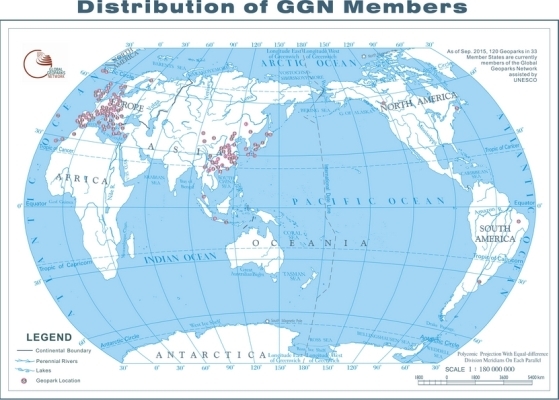 The European Geoparks Network(EGN) is a voluntary association of territories that share the same working method to promote and care for their local heritage, especially the geology. The objectives of the Network are contained within the Charter of the European Geoparks Network and were officially accepted on June 5, 2000 in Lesvos, Greece, it was signed by the four founder members of the European Geoparks Network. 1. A European Geopark is a territory which includes a particular geological heritage and a sustainable territorial development strategy supported by a European programme to promote development. It must have clearly defined boundaries and sufficient surface area for true territorial economic development. A European Geopark must comprise a certain number of geological sites of particular importance in terms of their scientific quality, rarity, aesthetic appeal or educational value. The majority of sites present in the territory of a European Geopark must be part of the geological heritage, but their interest may also be archaeological, ecological, historical or cultural. 2. 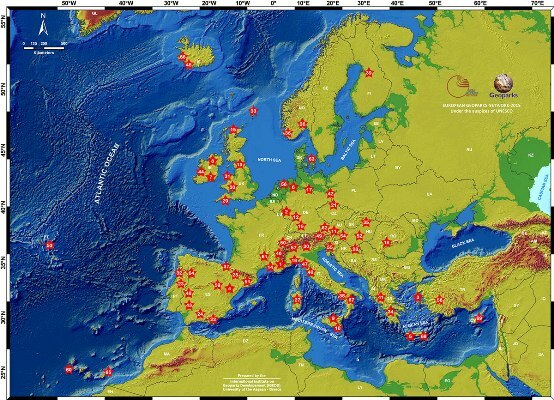 The sites in European Geopark form a network and benefit from protection and management measures. No loss or destruction, directly or via sale, of the geological values of a European Geopark will be tolerated The European Geopark must be managed by a clearly defined structure able to enforce protection, enhancement and sustainable development policies within its territory. 3. A European Geopark has an active role in the economic development of its territory through enhancement of a general image linked to the geological heritage and the development of Geotourism. A European Geopark has direct impact on the territory by influencing its inhabitants' living conditions and environment. The objective is to enable the inhabitants to re-appropriate the values of the territory's heritage and actively participate in the territory's cultural revitalization as a whole. 4. A European Geopark experiments with, develops, and enhances methods for preserving the geological heritage. 5. A European Geopark also has to support education about the environment, training and development of scientific research in the various disciplines of the Earth Sciences, enhancement of the natural environment and sustainable development policies..
6. A European Geopark must work within the European Geopark Network to further the network's construction and cohesion. It must work with local enterprises to promote and support the creation of new by-products linked with the geological heritage in a spirit of complementarity with the other European Geoparks Network members. April 2001. Execution of the Cooperation Agreement between UNESCO and the European Geoparks Network. October 2005. By the execution of the Madonie Agreement (Sicily, Italy) UNESCO recognises that every European Geopark belongs to the UNESCO Global Network of Geoparks. Thanks to the Global Network, we can bring into contact geoscientists and many other people who are environmentally aware and eager to learn more about the history of our Planet. UNESCO has already recognised 94 Global Geoparks all around the World (2013), and one of them is the Sobrarbe Geopark.